This is the story of my Pecos River fishing trip. It's the truth, the whole truth, and nothing but the truth, so help me!! I flew into Albuquerque, New Mexico in early September and drove up to Santa Fe. My niece’s wedding was going to be a two day event with the formal service on the second day. My wife and I had a wonderful time. The day after the wedding, I had a Pecos River fishing trip scheduled with Carlos Montoya, a world class guide and former executive chef. Carlos guides for the Reel Life , a fly shop in downtown Santa Fe and owned by Toner Mitchell. The Reel Life is an excellent shop, having everything an angler could want. I highly recommend using them should you be in Santa Fe and wish to fish the Pecos, or other local rivers. When I first met Carlos and looked at his business card, I said out loud using a Spanish accent, “Carlos Montoya, you killed my father, prepare to die.” This is a reference to the motion picture The Princess Bride. Actually, the character’s name was Inego Montoya, but I didn’t know that at the time I blurted out those words. Perhaps, Carlos Montoya was the father. Who knows? Carlos, the guide, understood the reference. 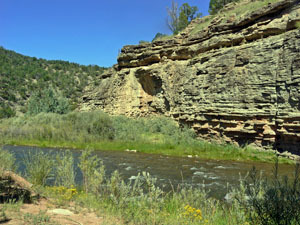 Anyway, Carlos and I proceeded to some private waters of the Pecos River about 40 minutes north of Santa Fe. The day was glorious with not a wisp of a cloud in the sky. We arrived at the gated entry to the private waters and went on through. The ride was a kidney shaker. Even with a 4x4, we never went faster than 10 mph. It took about 20 minutes to go the last mile. But we were now at the happy hunting grounds. Carlos, being the expert guide that he was, assembled all my gear and handed me a wading stick for security. I had informed him that I was a diabetic with neuropathy in my legs. The need to go slow was paramount to my safety. Carlos is also an EMT. We traversed the Pecos (it was only about 40 yards wide where we crossed) without incident and walked perhaps another 100 yards, where I decided to collapse. You see, the area was described as flat, but that’s only if you are Spiderman and know how to walk perpendicular to the ground. Where I’m from, flat ground means flat like Kansas or Florida. I’m guessing the word flat takes on a different meaning in New Mexico. Needless to say, at 7000 feet elevation, I was pooped out already. My Pecos River fishing trip was going to wane just a bit this day. However, I am never a pessimist. I always look on the bright side. The glass is always half full, not half empty. So, I did what I could. I fished for a bit, learned a few tricks on the use of streamers, and then headed back to camp. Now, it’s at the point where we re-crossed the Pecos that my pride was a bit hurt. I managed to get my right foot caught under a rather large boulder, and fell face-first into the Pecos. I held on to the wading stick with my right hand, but lost my water bottle which was in my left hand. 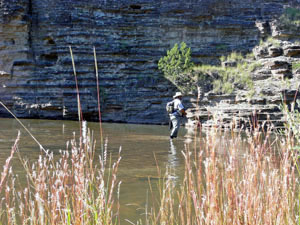 Since I fell fully parallel to the river, the waters of the Pecos inundated my clothing, despite wearing a full wader. Gee, does that sound like fun, or what? The next two hours were spent drying out. Carlos had thoughtfully provided a chair, sun block, and insect repellant. I watched as he fished. Afterward, he laid out the best lunch I have ever had on a fly fishing trip. It consisted of thinly sliced medium-rare New York strip, blanched fresh green beans, pesto, chilies (probably from Hatch, NM) and other goodies, too numerous to recount here. I didn’t have room for the dessert – my loss. That was my Pecos River fishing trip in a nutshell. The next day, my wife and I flew back home. I will always remember this trip with fondness and enthusiasm. 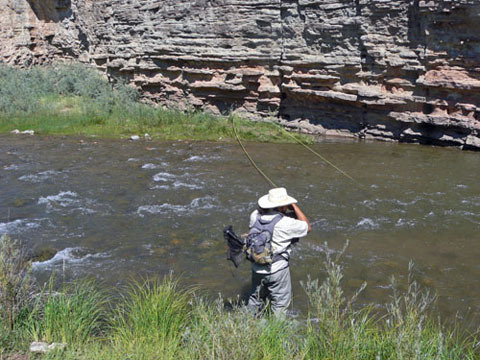 Pecos River fishing -- a delight and a half. Try it, you'll like it! !